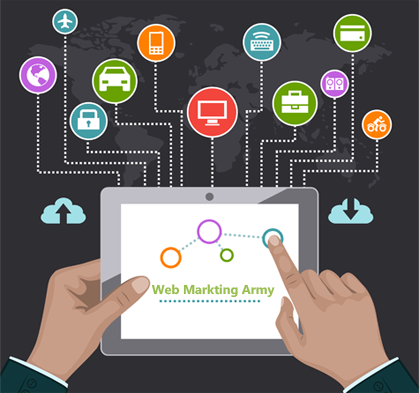 Web Marketing Army is a team of professional internet marketers based in Sri Lanka, offering a comprehensive range of services that will help grow your business and brand online, even in the face of tough competition. This includes Search Engine Optimization (so your website ranks well in Google’s search results), Social Media Marketing (building brand awareness through consumer engagement), Search Engine Marketing (advertising through platforms such as Google AdWords), Conversion Rate Optimization (so you get the absolute best results from your advertising budget), and Email Marketing (using only ethical methods that get results). In an age where every business has an online presence we will ensure that you have an advantage over the competition by implementing a cutting edge marketing plan, that utilizes only the most effective techniques and latest industry standards. This plan will be tailored just for you based on a deep analysis of your website and business goals, and we’ll foster an ongoing relationship where we monitor progress and celebrate the success together! Improve brand awareness and brand image with an engaging social media presence, which will lead to loyal customers and repeat sales. Improve your overall business reputation online through consistent branding, professionalism and ethical marketing practises. Improve the position of your web pages in Google and other search results for relevant and competitive keywords, using the latest proven SEO techniques. Manage your online advertising campaigns (Google AdWords), while constantly optimizing your ads to produce the maximum return on investment. Increase your overall online sales conversion rate by driving visitors who are actually willing to buy. Increase offline sales through brand awareness and loyalty. Over 10 years of experience at the forefront of the internet marketing industry. Internet marketing is what we do all day every day, not an extra service tacked on to something else. We work with our clients using a flexible and friendly approach. Guarantee the lowest rates for the level of service we provide. If you have a website for your business or your business is your website, Web Marketing Army is ready to help you get to the next level and achieve your goals. Contact us today so we can discuss your needs further and our expert team will build a strategy that is geared exclusively for bringing your business success!